A profit and loss statement (P&L) is an accounting of how your retail store performed during a certain period of time. Often referred to as your store's "financial reports" by a banker, these statements report on the history of your business and can also help predict the future. Most independent retailers have a P&L from their bookkeeper or accountant; however, they do not analyze the data when they receive it; they simply file it away in a drawer. Some retailers simply do not know how to read or interpret the data. A P&L looks at a short period of time typically 30 days. A balance sheet, on the other hand, looks at a longer period of time typically a calendar quarter or year. A balance sheet is a reckoning of our financial health at the time of the report. A P&L is a report of how you performed during a certain period. Together, these documents make up your financial statements. The first line on your P&L is Revenue. This represents your total sales for the reporting period. Often called the "top line" number it is an accounting of gross sales with no deductions. Net Sales is the line displaying your true sales since it deducts things like discounts and other markdowns from the top line. The next section of the P&L is the expenses. In this section, it accounts for all of your expenses for running the store. It is usually broken down into categories or buckets of types of expenses. For example, Cost of Goods Sold (COGS) reflects what the inventory cost you to bring it in. This section includes freight and any dating discounts you may have received from the vendor. The next section is Operating Expenses (OPEX) this one relates costs such as rent, utilities, and payroll. The next section is depreciation. This expense is for your equipment and furnishings. Typically, when you buy an asset, you must depreciate it over time. Think of your car, when you buy it for $30k it starts depreciating to the point if you sold it three years later, you might only get $18k for it. The same is true for your retail store. The POS system you paid $10k for is not worth $10k five years from now. In fact, with technology, it might not be worth anything! The Profit on your P&L is where it can get confusing. The first time you see this word, it will reflect revenue minus expenses; however, we still have to consider some other accounting terms. Your accountant may get more detailed and show a line called Earnings Before Taxes (EBIT). This is showing what your store made before that amount is taxed. To make it more confusing (not really, just more accurate) the next line is called Earnings Before Interest, Tax, Depreciation, and Amortization (EBITDA). This is a view without the depreciation expenses. Since depreciation is not actual cash leaving your account, this number more accurately predicts the health of your business. Finally, we get to the "bottom line," and we read net profit (sometimes referred to as net income.) This is the end result of all of the above. This is truly the money you get to put in your own pocket as the owner. 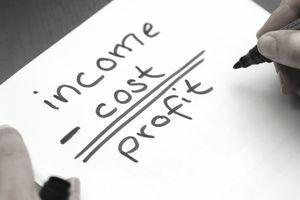 Here is the frustrating part of P&Ls when it comes to running your retail store - they tell the story of revenue and expenses, but not cash flow. Cash flow is key in retail. You need to be able to pay your bills each month. A P&L will show how much money your store made, but if you have large Payables (bills to your vendors for merchandise), the P&L will not reflect that. This is reflected in the balance sheet. For example, if you bought $1,000 worth of shoes from a vendor and the vendor gave you 90 days dating (90 days to pay it,) the sales of those shoes would show on your revenue line. But since you have not paid the bill yet, the cash you have in the bank from the sales may not be enough to cover the debt. In retail, cash is king, and the P&L does not tell you about cash. So in the last example, your balance sheet would show the revenue from the sale reflected in your cash on hand, but also the debt you owe to pay for it reflected in accounts payable. So while your P&L will show you made money on the sale, the balance sheet will still show that you owe the vendor and therefore look like you didn't get the revenue- at least not as much - since it has subtracted what you owe. Retailers are sometimes dumbfounded by this. Their P&L's say they are profitable, but they cannot pay their bills. Manage cash flow wisely, and this will never happen to you. Use the P&L to analyze your performance, but remember what it is telling you and what it is not telling you.